Adjunct Rizma is a Redguard Apostle found on the steps outside the Clockwork Basilica. 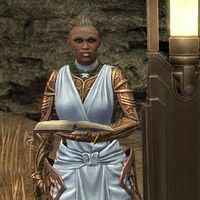 She can be found continually arguing with Sarvlos Velar, a Dunmer of House Hlaalu, who is frustrated about being trapped in Clockwork. As the main story progresses, so to do their arguments. Sarvlos Velar: "There must be some sort of mistake. I'm not meant to be here." Adjunct Rizma: "Your path has been set before you, auxiliary. I suggest you learn to walk it." Sarvlos Velar: "What nonsense are you spouting? Just tell me how to go back! I demand it!" Adjunct Rizma: "Choice is but chaos. Demands but the selfish needs of those who would follow the Motion of Lines." Sarvlos Velar: "Everyone in this place is fetching mad!" "Finding your place here within our city is to become a gear within a glorious machine. Greatness lies within us all, should we find the will to merge our fractured selves."